19.04.19 19:50;Account;Receive;Received Payment 2.00 USD from account U18882805 to account U1294000. Batch: 256624455. Memo: API Payment. Withdraw to allhyips from CRYPTEX TRADE LTD.
21.04.19 18:13;Account;Receive;Received Payment 2.00 USD from account U18882805 to account U1294000. Batch: 256833986. Memo: API Payment. 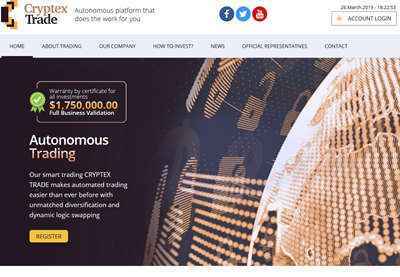 Withdraw to allhyips from CRYPTEX TRADE LTD.
20.04.19 20:21;Account;Receive;Received Payment 2.00 USD from account U18882805 to account U1294000. Batch: 256742835. Memo: API Payment. Withdraw to allhyips from CRYPTEX TRADE LTD.